Great action-packed shot. Very nice. That looks like a wicked wind. Best viewed from the comfort of my living room. 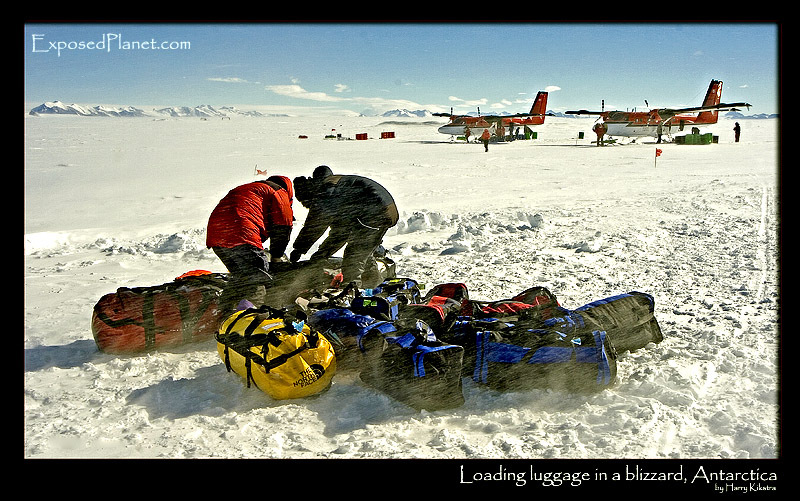 The story behind "Loading luggage in a blizzard, Antarctica"
It might be light 24 hours per day, but boy what was it cold once this little wind started blowing. We were packing to get ready to fly with the Twinotter planes you see in the back, to Mt Vinson, the highest mountain of Antarctica and therefore one of the 7 summits. Click the buttons below to Tweet, Stumble, Reddit or Digg! New: Check out the dedicated EP poster store, order customized and framed posters here, and the ExposedPlanet Travel Photography Blog with tips, tricks and more..
ExposedPlanet has been made possible and inspired by 7summits.com Expeditions, the Internet and the real world: Subscribe to posts (RSS or email). All images and content are copyrighted © Harry Kikstra, ExposedPlanet.com 1998-2012. It might be light 24 hours per day, but boy what was it cold once this little wind started blowing. We were packing to get ready to fly with the Twinotter planes you see in the back, to Mt Vinson, the highest mountain of Antarctica and therefore one of the 7 summits.